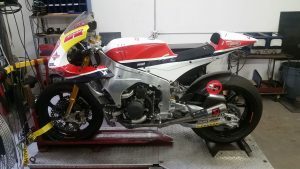 The most recent bike on our motorcycle dyno, a hand made Kalex Moto2 from Europe. This bike is 2 inches shorter than the shortest bike I ever had on the dyno before… total work of art! If you want to get the absolute most performance out of your bike putting it on the dyno is the way to go.